Find important news about our efforts to end deadly truck underride crashes here. You can help. Sign & share the STOP Underrides! Petition here. Media reports and video footage of successful crash testing at the D.C. Underride Crash Test Event, on March 26, 2019, can be found here. Hear the Underride Panel Discussion at the D.C. Underride Crash Test Event here. On December 20, 2017, Senator Gillibrand questioned Chris Spear, CEO of the American Trucking Associations, at a Senate Environment & Public Works Committee Hearing. See response to his questions here: Sen. Gillibrand questions Chris Spear, CEO of ATA, on truck underride protection. Eric Flack, Investigative Reporter at WUSA9, recently began an extensive investigation into truck underride. The segments which have already aired are listed here. They plan to shed light on the problem until it is adequately addressed in this country. The complete WUSA9 Underride Investigations Series can be found here. Most recent WUSA9 coverage of the D.C. Underride Crash Test Event. Lois Durso (left) holds a picture of her daughter, Roya. 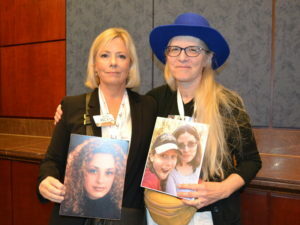 Marianne Karth (right) holds a picture of her daughters, AnnaLeah and Mary. IIHS co-hosted the Second Underride Roundtable with the Truck Safety Coalition and AnnaLeah & Mary for Truck Safety at their , on August 29, 2017.